Here, in a teaching of outstanding completeness and clarity, the Dalai Lama sets out the key principles of Buddhism, showing how the mind can be transformed, and suffering overcome, through love, compassion, and a true understanding of the nature of reality. By illustrating his brilliant overview of the path with his own personal experiences and advice on how to integrate the practice, the Dalai Lama brings these teachings to life. The Dalai Lama delves deep into the teaching of the Great Perfection, or Dzogchen. His enthusiasm and admiration for this profound tradition shine through as he comments on an important work by the great Dzogchen master Longchen Rabjam, Finding Comfort and Ease in Meditation on the Great Perfection. This teaching, with its remarkable breadth and richness, was originally given to an audience of ten thousand in France in 2000, and this book perfectly captures the majesty of the occasion. As Sogyal Rinpoche, the Dalai Lama's host for the occasion, said, "All of us were moved by the depth, relevance, and accessibility of these teachings; there were those who said that they were among the most remarkable they had ever heard him give. To receive these teachings from him was the opportunity of a lifetime." 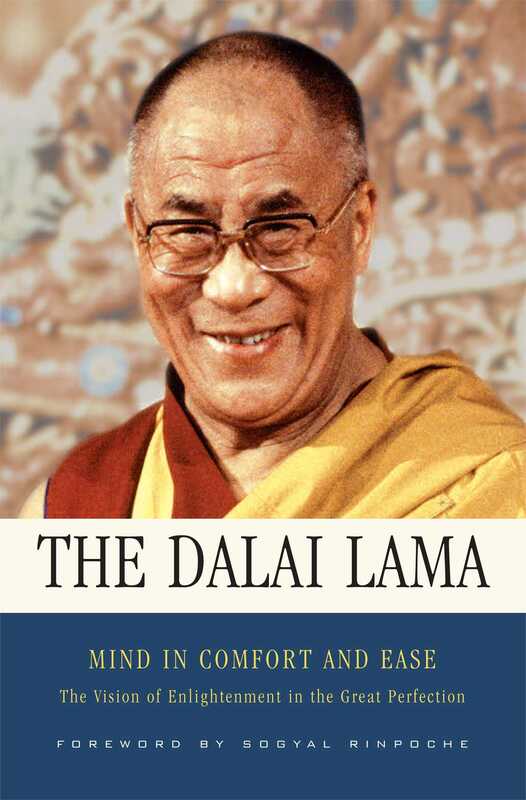 Blending the highest wisdom with the deepest compassion and humanity, Mind in Comfort and Ease offers a glimpse into the Dalai Lama's wisdom mind and a panoramic view of the Buddhist path. "This extraordinary and essential book of live oral teachings, transmitting the sublime View, Meditation, Action & Result of the direct-access Dzogchen approach to incandescent awareess and the natural state of spiritual living, provides us with the basis for meaningful study and meditation practice for years and generations to come." "This attractive volume should delight both scholar and practitioner, and can now take its place as an experientially based and intellectually solid contribution to the living study and practice of the Buddhadharma." "This is one of the absolutely best and richest books on meditation practice that I have ever read. Here are finely nuanced Dzogchen teachings, offered by His Holiness with remarkable precision and clarity, and with astonishing humility and candor. A precious resource for anyone who loves the Dharma and is committed to its embodiment. This book has it all." "All who wish to be at ease in the awakened, boundless, sublime nature of their own minds-- Buddhahood--should cherish/read this book." "In this book, His Holiness the Dalai Lama draws on his vast learning and insight to reveal both the meaning of the Great Perfection and its place within Buddhism as a whole. He also illuminates the interface between Buddhism and modern science, highlighting the materialistic assumptions that hinder the scientific study of consciousness. This beautifully translated book is a treasure, of great value to all who are interested in fathoming the secrets and possibilities of the mind." "All of us were moved by the depth, relevance, and accessibility of these teachings; there were those who said that they were among the most remarkable they had ever heard him give. In a wholly original, but always authentic, way, His Holiness brought a sense of his own personal quest, as he explored the whole Buddhist path, and particularly the pith instructions of the great masters of the Great Perfection."